People that travel frequently owing to professional reasons or personal choices loves to save on their travel budget in total! And the best way to save is by opting in for discounts and deals available on hotels. This is where ezeego-1 comes into use and allows you to get some of the best discounts on hotels. By making use of the ezeego-1 discounts that are listed in HappySale you can also get as much as 10% cash back offers on your international hotel booking. The deals vary based on twin sharing basis for adults. There are other deals related to flights and holidays as well. You can even avail some of the best package deals for destinations like Goa from this online platform. So whatever be your requirement, browse through the ezeego-1 coupons and deals on HappySale, select and activate the same within the validity time. Book any domestic air ticket on Air India(AI), GoAir, IndiGo, Jet Airways(9W) and SpiceJet through Ezeego One Travel & Tours Ltd. and get Flat Rs.500 cashbak per passenger per return ticket. Flat Rs. 250 cashback per passenger per one-way ticket. Offer is valid for bookings made using your Master / Visa Credit & Debit Cards or Net Banking only. Payments made through Standard Chartered, HSBC & Citi Credit/Debit card, Oxicash / Paymate or Cash on Delivery options are not eligible under the offer. Ezeego1 is offering best price on holiday packages. Its range starts from Rs 10000 on words. Choose for locations in India and abroad. Top holiday destinations like Goa, Andaman, Srilanka, Dubai, Thailand, Bangkok, Maldives and more. No coupon code is required. Verified on 23/4/2019 . With Ezeego1 celebrate long weekends with upto Rs 20000 Off. Activate the deal and book your holiday now to avail this discount without using any discount coupon. Hurry up and book now! Get Cashback up to Rs. 9000 on International Return Air Tickets. Offer is valid for bookings made using your Credit/Debit Cards or Net Banking only. Payments made through Standard Chartered, HSBC & Citi Credit/Debit card, Oxicash / Paymate or Cash on Delivery options are not eligible under the offer. Verified on 23/4/2019 . Get 10% cashback on booking any India hotels. Offer is valid only for adults on twin sharing basis. To avail the offer, kindly enter in the promo code section on the payment page. Note - validation of promo code does not guarantee cashback, terms and conditions have to be met. Offers are valid for bookings made using Credit / Debit or Net banking only. Cashback amount will be processed on NET amount after deducting service tax. Book your hotel now. Book your flight tickets with Ezeego1 and avail best deals. Here you can get upto Rs 1200 off on your flight booking. Apply the coupon code on your payments page to make avail of this offer. No other coupon codes can be clubbed with this deal. Book and save now! Thailand, known as the land of smiles, is one of the hottest tourist destinations in the world. Whether you talk about world class beaches in the South or mountain villages in the North, Thailand has all the reasons to be in your bucket-list. Click activate deal to know about holiday packages. Ezeego1 summer flash sale: Get flat 25% off on holiday packages. Choose from Ladakh, Andaman, Himachal pradesh, Thailand & SIngapore. Check more details at merchant website. Click activate deal. Visit Ladakh in this summer. Package prices starting at Rs 20000. Choose from no of days/night staying packages. Check more details in the landing page. Ezeego 1 is an online portal to book hotels and flights. Book here and get 10% cash back on booking any international hotels. Offer is valid only for adults on twin sharing basis. This offer is valid on bookings made from 6th October 2016 to 31st December 2016 & for travel till 31st March 2017. Offers are valid for bookings made using Credit / Debit or Net banking only. Book now. Get Flat Rs. 700 cashback per passenger on domestic return tickets. Valid on Air India(AI), GoAir, IndiGo, Jet Airways(9W) and SpiceJet through Ezeego One Travel & Tours Ltd. through Ezeego One Travel & Tours Ltd. Apply coupon code at check out page to get cashback. Ezeego 1 is an online portal to book hotels and flights. Book here and get 10% cashback on booking any international hotels. Offer is valid only for adults on twin sharing basis. This offer is valid on bookings made from 6th October 2016 to 31st December 2016 & for travel till 31st March 2017. Offers are valid for bookings made using Credit / Debit or Net banking only. Book today. 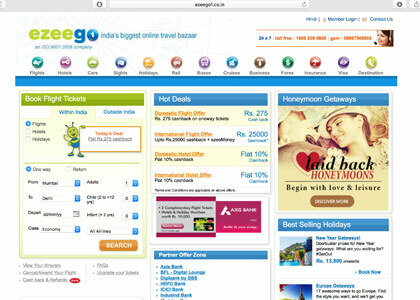 Ezeego 1 is offering flat Rs 275 cashback on domestic flight bookings. Use this Ezeego discount code to avail this offer. Book any domestic air ticket on Air India(AI), GoAir, IndiGo, Jet Airways(9W) and SpiceJet through Ezeego One Travel & Tours Ltd. between 16th December and 31st December 2016 get flat Rs 275 cashback. Book now. Ezeego 1 brings flat 10% cashback on domestic hotels. Offer is valid only for adults on twin sharing basis. This offer is valid on bookings made from 16th December 2016 to 31st December 2016 & for travel till 31st March 2017. Book now. Book any domestic air ticket on Air India(AI), GoAir, IndiGo, Jet Airways(9W) and SpiceJet through Ezeego One Travel & Tours Ltd. between 1st February and 15th February 2017 get Flat Rs. 275 Cashback. Offer is valid for bookings made using your Master / Visa Credit & Debit Cards or Net Banking only. Payments made through Standard Chartered, HSBC & Citi Credit/Debit card, Oxicash / Paymate or Cash on Delivery options are not eligible under the offer. One of the core aspects of traveling outstation for work or personal tours is accommodation. If you want to arrange your entire traveling within your budget and save simultaneously, you need to spend judiciously on your hotel room expenses, as this occupies a meteor chunk of your travel cost. Though in the recent times there have been several online websites that provide best deals on hotels, the real task is to search an authentic deal that will enable you to save more and also stay in the best condition possible. To make the most of your budget you can simply opt-in for the ezeego1 coupons that today are available on HappySale. Ezeego-1 is a well-known web portal that allows travelers and tourists to select from the discounted hotel rooms with standard hotels and stay within their budget, without compromising on the service quality. When you select from the ezeego1 promo codes available on HappySale you get to select from both the twin sharing rooms, deluxe rooms as well as single-bed rooms. The hotel rooms that are on offer are clean, comfortable and equipped with the basic qualities such as refrigerator, bathroom amenities, towel, soap, hair dryer, coffee machine, cupboard, study table, air-conditioner and when you are booking rooms of elite hotels you can also expect extra facilities like free Wi-Fi connection and the like. When you are browsing on HappySale you can get your discounts from popular brands such as Musafir, Goibibo, Ixigo and even Easemytrip and other popular names. You can select from the wide range of promotional offers, cashback deals and other discounts that are available on domestic flights, hotels as well as city-specific discounts. So keep browsing and book the best deals! The top hotel destinations to India is Goa, Delhi, Bangalore, Chennai, Mysore, Karnataka, Ooty, Mysore and lot more. Hotels in the international destinations can be booked at Kuala Lumpur, Dubai, Singapore, New York, London, Pattaya, Paris, Amsterdam and so on. Enjoy holiday packages at the most exciting places like Andaman, Goa, Kashmir, Kerala, Ladakh, Coorg, Dubai, Australia, Mauritius, Thailand, Maldives and so on. All the visa services that are required for visiting any country can be taken care by ezeego1. These include single entry visa, multiple entry visa, re-entry visa, business visa, student visa, work permit visa and lot more. To make sure that you are browsing and selecting from the best and authentic ezeego1 coupon codes that are available online, you simply need to keep browsing HappySale. Here you can know more about the deals by reading the deal description and then activating the deal within the specified timeline.